Do you find yourself asking people to repeat themselves in conversation, or having to turn up the volume on the TV or radio? If you’ve noticed your hearing’s not as sharp as it used to be, it’s time to take a trip to your local ear specialist, known as an audiologist. Don’t worry – getting a free assessment from a hearing specialist is simple and straightforward. And if you’re one of the 11 million people in the UK who have some kind of hearing loss, there are lots of treatment options available. If you have questions about your hearing, you’re not alone. Here are the answers to some of the most common questions our Leightons hearing specialists are asked. Hearing problems can develop slowly over time, and many patients live with hearing loss for a long time before they address it. In fact, in the UK it takes patients an average of ten years to get treatment for their hearing loss. Just as you have check-ups for your eyesight and dental health, it’s best to visit a hearing doctor regularly so you can monitor any changes to your hearing. If you’re over 50, we recommend you have a hearing test once a year. What will happen at my hearing test? At our Leightons free hearing tests, you’ll be treated by an audiologist who can diagnose any hearing problems and recommend the best course of treatment. Your specialist will start by asking you a few questions about your lifestyle, and any factors that might affect your ear health. Your hearing doctor will then use a video otoscope which is an instrument with a tiny video camera to create a full picture of your eardrum and ear canal. 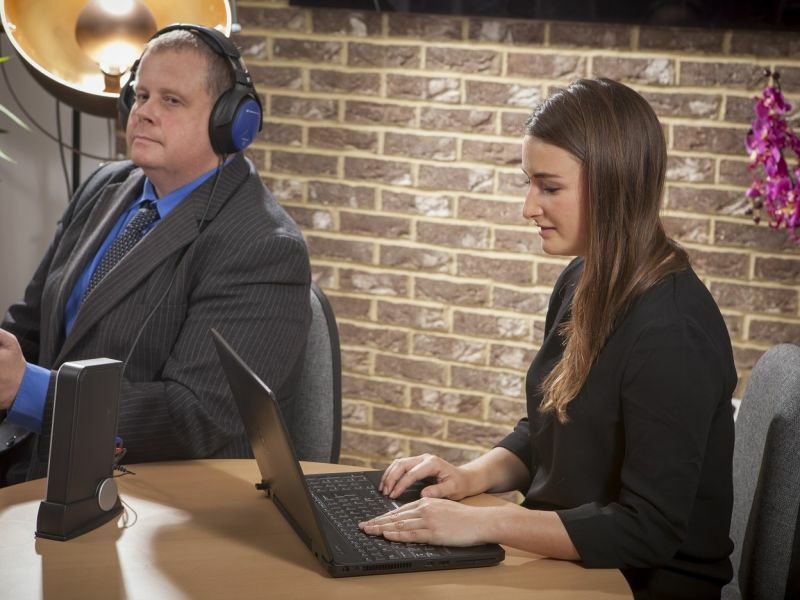 You’ll also receive hearing tests including a pure tone audiometry test, which tells us how well you can hear different levels of sound, as well as a speech-in-noise test, which measures how well you can hear in noisy environments. All this information helps our Leightons specialists build your hearing health report, which will highlight any problems and help us decide the best way to treat you. Book your free hearing test today. Can I have a hearing test at home? Yes. Our specialist portable equipment means our hearing specialists can bring their expertise to you. We offer full hearing assessments as part of our home appointments, including services such as video otoscopy, tinnitus advice, wax removal and hearing aid consultations – all from the comfort of your own home. The two main types of hearing loss are sensorineural and conductive conditions. Sensorineural hearing loss is the most common type of hearing condition, resulting from damage to hair cells inside the cochlea or hearing nerve. As we get older, damage to the cochlea often occurs naturally, which is why many people experience this type of hearing loss as part of the ageing process. Today, we all enjoy longer life expectancies, meaning types of age-related sensorineural hearing loss such as presbycusis are becoming increasingly widespread. Sensorineural hearing loss can also be caused by exposure to loud noises, certain medications, or simply because of your genetics. Conductive hearing loss is sometimes temporary, and can be caused by ear conditions such as an infection, a ruptured eardrum, or a build-up of earwax. It can also be more permanent due to conditions such as malformation of the middle ear bones and head traumas. The best treatment option will depend on the cause of the problem. For example, ear wax removal can improve some types of hearing loss, while acute ear infections can be treated with a course of antibiotics prescribed by your GP. While some people try to live with hearing loss, many can benefit from a hearing aid. These are small electronic devices worn in or behind your ear, which use tiny built-in microphones to amplify sounds and deliver them to your ears through a speaker. Hearing aids can be life-changing, helping to restore your confidence in social situations. As well as helping you hear during day-to-day activities, such as making phone calls or watching TV, hearing aids can also help to keep you safe by making sure you hear vital sounds such as alarms and traffic noises. Hearing aids come in all shapes and sizes, and our hearing aid specialists can help you find the right model for you. There have been huge advances in hearing technology and design, and today’s hearing aids are comfortable and discreet – some digital models even come with features such as Wi-Fi connectivity. Many hearing aids can also now adapt to different environments – so whether you’re at home, out and about, or listening to music, your hearing aid can help you hear life to the full. When you come in for a Leightons free hearing assessment, our specialists can also provide a free demonstration of a full range of new digital hearing aids. Can I test my new hearing aid? Yes. As well as a free hearing aid demonstration, we offer a free 30-day trial of your chosen hearing aid to make sure it’s the right solution for you. Once you’ve found a hearing aid that suits you, we’ll provide free aftercare, including hearing check-ups every six months either in your local Leightons branch or at home. We’ll also give you up to five years of free batteries for your hearing aid and a manufacturer’s warranty of up to five years. Having a little earwax is normal and healthy – it moisturises your ears and help to keep them clean by trapping dirt particles. It also has antibacterial properties which guard against infection. Yet, when earwax builds up too much it can cause all sorts of problems, including hearing loss, earaches, and even tinnitus and vertigo. Luckily, our Leightons ear specialists can help remove any excess earwax. You shouldn’t try to get rid of earwax at home: techniques like cotton buds can actually push earwax further into the ear canal and cause blockages. At Leightons, we offer a range of earwax removal techniques, including microsuction and water irrigation. To find out more and book an appointment, visit your local branch or give us a call on 0800 40 20 20. Tinnitus is a common hearing loss condition, experienced by 1 in 10 UK adults and 30% of people over 70. Tinnitus is usually described as a ringing or whistling sound in the ears. Different people hear different types of noises, including buzzing, pulsing beats or even music. Yes. There is no one-size-fits-all cure for tinnitus, but it can be managed. Living with tinnitus can be distressing, but our Leightons ear specialists can help you. We offer a free tinnitus consultation service to help you decide on the next step. It’s easy to protect your ears using specialist earplugs such as the ACS Ear Protection range. Ideal for protecting your ears from loud noises, or when you go swimming. Our friendly and knowledgeable ear specialists are here to help. If you’re looking for a hearing test or tinnitus consultation, need earwax removal treatment or simply have questions about your ear health, get in touch. You can book an appointment online, visit your nearest branch or call us on 0800 40 20 20.